Carrum Downs bass teacher Jeremy LaBrooy will tell you there’s no better instrument to play than the bass. He has been teaching bass for over 25 years and currently teaches from his music studio in Sandhurst. Looking for a Bass Teacher in Carrum Downs? Jeremy has all of the qualifications and experience of a bass teacher Carrum Downs. He has a teaching qualification from Monash University and a music qualification from the Victorian College of The Arts. Try Out 3 Trial Bass Lessons – Private bass tuition with Jeremy! Jeremy can give you private bass lessons in Carrum Downs and surrounding areas. His vast music industry experience will have you playing the bass exceptionally well in very little time. You can read about Jeremy’s bass teaching philosophy or take a look at his bass guitar tuition rates here. If you are local to the Carrum Downs area you will know the suburb of Sandhurst which is where Jeremy’s music studio is located. Jeremy is currently offering a special deal for new students. You can buy a Trial Pass for $50 (ex GST). 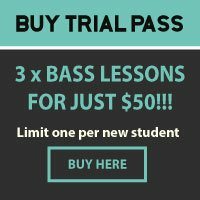 The trial pass entitles you to three (3) x 30 min weekly bass lessons at a saving of over 60%. You can purchase your trial pass online using Paypal. Bass Teacher Carrum Downs, Bass Teacher Seaford, Bass Teacher Langwarrin, Bass Teacher Cranbourne, Bass Teacher Frankston, Bass Lessons Carrum Downs, Bass Lessons Seaford, Bass Lessons Langwarrin, Bass Lessons Cranbourne, Bass Lessons Frankston, Bass Lessons Dandenong.